Review by AllTheBestFights.com: 2015-11-07, good pace and nice exchanges from the first bell: Timothy Bradley vs Brandon Rios gets three stars. The former world champion in two different weight classes Timothy Bradley Jr entered this fight with a professional boxing record of 32-1-1 (12 knockouts) and he is ranked as the No.6 welterweight in the world. He suffered his only loss last year when he faced #1 Manny Pacquiao in their rematch (=Pacquiao vs Bradley 2), after this bout he drew with Diego Gabriel Chaves (=Bradley vs Chaves) and won over Jessie Vargas (=Bradley vs Vargas). His opponent, the former WBA Lw champion Brandon Rios, has an official record of 33-2-1 (24 knockouts) and he entered as the No.9 in the same weight class. He lost two consecutive fights in 2013, against Mike Alvarado (=Rios vs Alvarado 2) and Manny Pacquiao (=Pacquiao vs Rios), after this bout he came back to win in 2014 with Diego Gabriel Chaves (via disqualification, Rios vs Chaves) and he has taken revenge on Alvarado in 2015 (=Alvarado vs Rios 3). 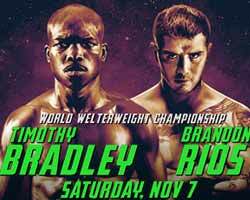 Bradley vs Rios is valid for the WBO World welterweight title. Watch the video and rate this fight! Review by AllTheBestFights.com: 2015-06-27, nice and tough exchanges between Timothy Bradley and Jessie Vargas: it gets three stars. Juan Manuel Marquez in 2013 (=Bradley vs Marquez). After this fight he was defeated by Manny Pacquiao in their rematch (=Pacquiao vs Bradley 2) and he drew with Diego Gabriel Chaves (=Bradley vs Chaves). His opponent, the former Wba light-Ww champion Jessie Vargas, has a perfect record of 26-0-0 (9 knockouts) and he entered as the No.4 super lightweight. He fought three times last year beating Antonio DeMarco in his last bout (=Vargas vs DeMarco). Bradley vs Vargas is valid for the interim WBO World welterweight title. Watch the video and rate this fight! 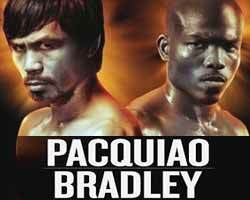 Review: 2014-12-13, good fight between Timothy Bradley and Diego Chaves: it gets three stars. Timothy Bradley entered this fight with a professional boxing record of 31-1-0 (12 knockouts) and he is ranked as the No.5 welterweight in the world (currently the #1 in this division is Floyd Mayweather Jr); he has won world titles in two different weight classes but he lost the Wbo Ww belt in his last bout, against Manny Pacquiao in their rematch (=Pacquiao vs Bradley 2). His opponent, Diego Gabriel Chaves, has an official record of 23-2-0 (19 KOs=82%) and he entered as the No.28 in the same weight class and he lost two out of his last three fights: against Keith Thurman (=Thurman vs Chaves) and Brandon Rios (=Rios vs Chaves); between these two bouts he defeated Juan Alberto Godoy. 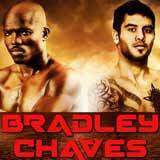 Bradley vs Chaves is the mian event of the evening. Watch the video and rate this fight! 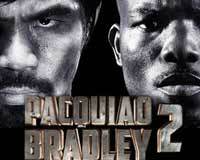 Review: 2013-10-12, close and pretty good fight between Timothy Bradley and Juan Manuel Marquez: it gets three stars. The undefeated Timothy Bradley (30-0-0, 12 KOs) entered as the No.2 welterweight in the world while the 40-year-old Juan Manuel Marquez (55-6-1, 40 KOs=72%) entered as the No.1. 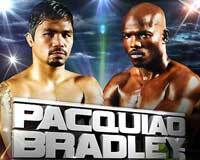 Bradley vs Marquez is valid for the WBO welterweight title (Bradley’s second defense). Watch the video! Review: 2012-06-09, good fight, especially the central part of the bout from fourth round to the eighth, but unfortunately the judge’s decision was outrageous: Manny Pacquiao vs Timothy Bradley gets three stars (fight ended by split decision). Compubox punching statistics showed that Pacquiao landed a total of 253 of 751 punches compared to 159 of 839 for Bradley; moreover Harold Lederman scored the fight 119-109 in favor of Pacquaio: so how is that decision made? Probably before the fight happened, just for money, since the rematch was already set for November…and Bob Arum himself confirms this version, here’s what he said after the fight: “I’m going to make a lot of money on the rematch, but this [decision] was outrageous”. Manny Pacquiao (54-3-2) entered as the No.1 welterweight in the world while the undefeated Timothy Bradley (28-0-0) entered as the No.2 light welterweight. Pacquiao vs Bradley is valid for the WBO welterweight title (Pacquiao’s fourth defense); they also faced each other a second time on April 12, 2014 (=Manny Pacquiao vs Timothy Bradley 2). Rate the video! Review: 2011-11-12, Timothy Bradley dominated and won Joel Casamayor by TKO but there was too much clinching: two stars. The undefeated Timothy Bradley (27-0-0) entered as the No.1 light welterweight in the world while Joel Casamayor (38-5-1) entered as the No.31. Bradley vs Casamayor is valid for the WBO light welterweight title (undercard of Pacquiao vs Marquez 3). Watch the video!